Thank you to Good Earth Beauty for providing a sample and sponsoring the giveaway. Raise your hand if you've had a pumpkin spice latte this year! My hand is not raised...yet. I'm not ready to let go of my frappes from summer, but if the temperatures keep dropping, I'll be switching to pumpkin soon. 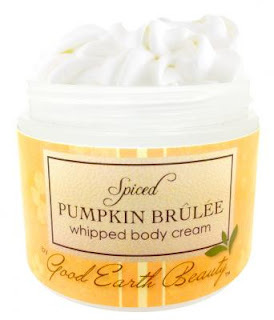 Even if you are like me and haven't your obligatory pumpkin spice drink this year, you can smell like a pumpkin brulee with this amazing body cream. Good Earth Beauty was generous enough to send me a bottle to sample and one for my readers to enjoy! 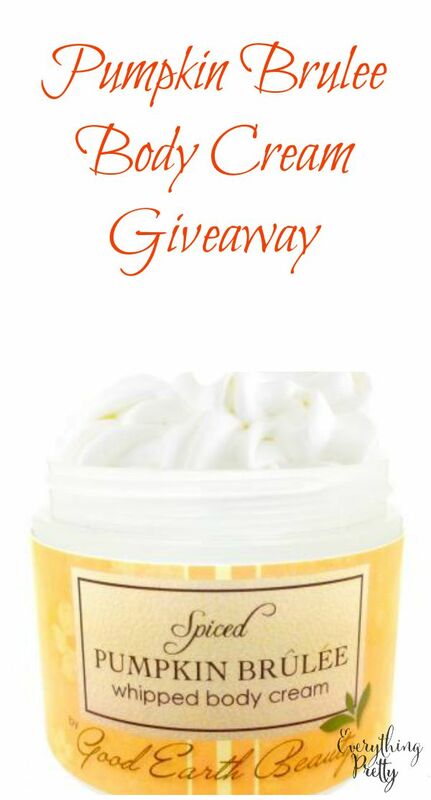 Enter the giveaway below for your chance to win one. Good Earth Beauty is a family own company that sells natural or organic products. None of the products they carry are tested on animals. Many of the companies on the site are family owned with high quality products that you might not see on other sites. Most products are made in America too. The pumpkin brluee body cream is full of vitamins and nutrients that your skin needs to stay healthy and soft. It firms skin and boosts elasticity while it absorbs in to your skin quickly. There are no parabens, pesticides, artifical colors, petroleum, propylene glycol, sulfates, or phthalates in this product. The smell is heavenly; pumpkin cake batter with hits of spice and rich vanilla caramel.